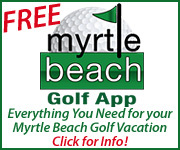 Play golf in Myrtle Beach by booking golf tee times with On The Green Magazine. 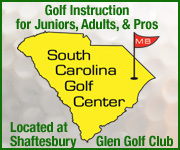 These “Myrtle Beach golf courses” also include Pawleys Island golf courses in the south, Surfside, Garden City, and Murrells Inlet golf courses, Myrtle Beach and North Myrtle Beach golf courses, as well as Brunswick County golf courses in North Carolina. 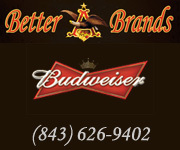 You can make golf reservations on almost all of them through On The Green Magazine at very reasonable rates. If you’ve played any of the courses listed below, be sure to give them a star rating. Other golfers will appreciate your opinion. 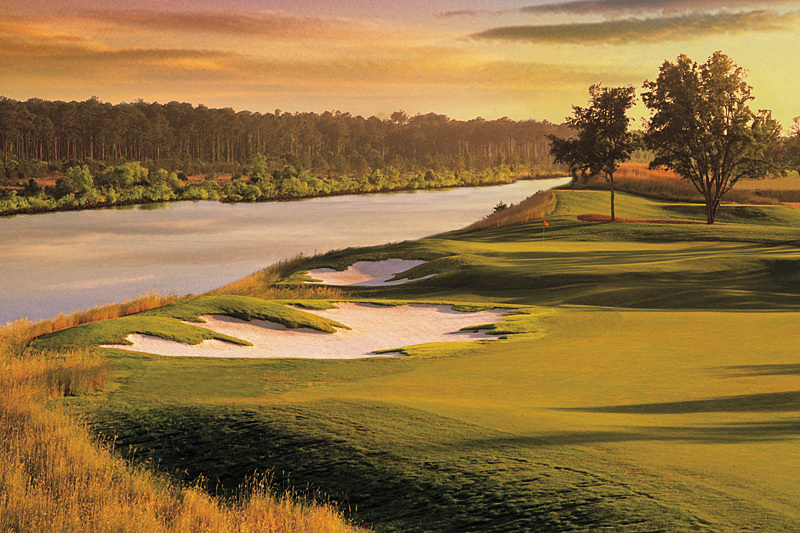 South Carolina’s “1998 Golf Course of the Year.” Designers Ray Floyd and Tom Jackson have sculpted Arrowhead’s 27-hole complex into a 27-hole aesthetic masterpiece. The superior links-style design unfolds itself in a relaxed, gracious manner enticing golfers with beauty while taunting them with danger. Each hole presents a different problem to test the golfer. The only university golf course on the Grand Strand. 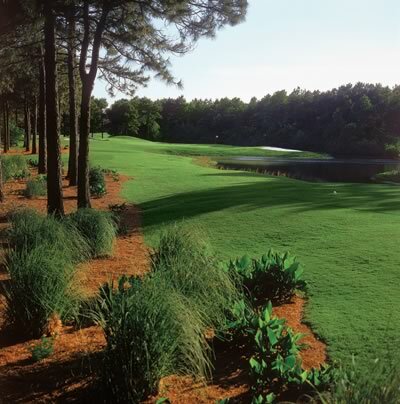 This par 72 golf course is operated by Coastal Carolina University’s Professional Golf Management program. Distinctly molded in the image of the British Isles links courses, with holes reminiscent of familiar links like St. Andrews, and lesser known gems like Lahinch and Cruden Bay. Large expanses of natural growth, sand, water and waste areas combine with extraordinary undulations and bulkheads to present a course reminiscent of the PGA West Stadium Course. Arnold Palmer has created what many believe to be one of the finest golf courses in the Myrtle Beach area – one of the most visually exciting and challenging courses in America. An Arnold Palmer gem that winds through a magnificent setting of coastal wetlands and hardwood forests. SouthCreek is said to be the “finess” course of the three courses at National. From the regular tees, golfers of all abilities will enjoy this classic Arnold Palmer design. But be prepared for a challenge from the back tees, as the many natural hazards come into play. 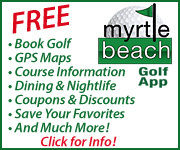 Your one stop shop and direct link to over 70 courses in the Myrtle Beach area and is home to some of the best, challenging and fun golf courses in the country. Stretching along the Intracoastal Waterway, the course serves up a variety of hazards and bunkers to test your shot-making abilities as you play your way onto the large, undulating greens. Bears the distinction of being the only Grand Strand golf course designed by award-winning architect Arthur Hills, who is often called upon to redesign venues for PGA and USGA events. Originally built upon natural dunes less than a half mile from the ocean and features numerous freshwater lakes and rolling fairways. Designed by architect Robert White. A true championship course – elevated greens, picture-perfect traps, wide-flowing fairways, demanding doglegs, tantalizing par 3’s and long par 5’s. Always in great condition. Readers of The Sun News voted Whispering Pines the “2003 Locals Favorite Course” and the area’s “Best Golf School”. Near the Myrtle Beach International Airport. This signature course presents creative contouring, elevated tees and greens, and an all around uniqueness. Golfers come back to this favorite year and after year. A tee time at World Tour is the equivalent of a golfing passport to some of golf’s most exclusive clubs. Guests are assured a golfing experience like no other.